Storytelling and communication have always intrigued Kathryn West, who puts those interests to use at SSA. “As a child, I liked to read and was always drawn to books about health and how people deal with illness,” says West. 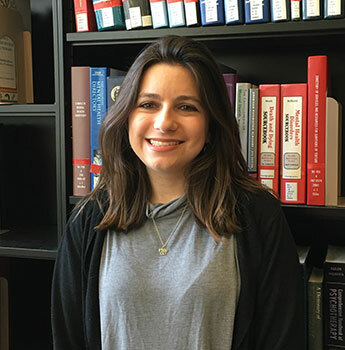 She is completing the Graduate Program in Health Administration and Policy (GPHAP) program of study, an interdisciplinary program that is based at SSA that includes students from UChicago Booth, Harris, Law, and Pritzker. As part of GPHAP, she participated in the Interprofessional Student Hotspotting Learning Collaborative, as part of a team of students representing social work, medicine, pharmacy, nursing, business, and policy that met on a regular basis with people who are heavy users of the medical system. Research has shown that a small group of patients with multiple, complicated conditions can become the heaviest users of medical services. The students met with patients, held weekly meetings as a group with a faculty mentor, and took part in monthly teleconferences with students around the country who are participating in the program. They also attend national conferences. The Student Hotspotting program is intended to determine if better social services can lead to better outcomes for the patients who make frequent visits to hospitals. The student team visited one middle-aged woman in the hospital after a surgery. “After sitting with that one patient, it became clear how isolating illness can be, especially when it requires hospitalization. There’s always talk about how hard it is for patients to make it to their appointments, but it’s often hard for friends and family members to visit patients when they’re in the hospital, which makes the experience of being hospitalized even more isolating,” says West. West’s storytelling background includes her undergraduate years, when she was a creative writing major at Northwestern University. West had opportunities to learn about storytelling and medicine when she completed a documentary as a senior project, which allowed her to tap into the conversations happening at Rush University Medical Center and connect with patients. In the documentary, family members and others in the community provided their perspectives on the problem of securing an organ transplant, that is made worse by the lack of medical insurance. Although 20 percent of transplanted organs come from the uninsured, only one percent of the uninsured are able to get transplants, the documentary points out. “I think it’s important that patients are able to tell their stories and for people to listen. Often the conversation in the doctor’s office is one in which the doctor does most of the talking,” she says. Another way in which West uses her communications skills is as an editor for the Advocates’ Forum, the student journal at SSA. It is one of only a few master’s level, student produced journals in social work schools around the country. “As an editor, it’s always a balance with submissions. We want to accept the pieces that are the best as they are; on the other hand, we want to leave room for growth as the piece changes with editing. This is the same process as with hearing any other story and wanting to hear what’s there, but also what can be filled in and added. It’s a constant movement of writing and rewriting your story when you’re the one telling it and also when you’re hearing stories from others,” she says.